A team of scientists announced they have harvested hydrogen from water in microgravity – a proof-of-principle test that may one day lead to a way to acquire fuel or other resources during a long-distance, crewed space mission. Long-term space travel involves many difficult problems that short trips to the moon or the International Space Station do not. Where will the fuel come from? Will everything (including the human body) actually work after years in microgravity, where there are minimal buoyant forces? An international team of researchers put their experiment into a theme-park-like drop tower to answer some of these questions. “This is something new that hasn’t been done before that was surprisingly successful,” Katharina Brinkert, postdoctoral scholar at CalTech, told Gizmodo. 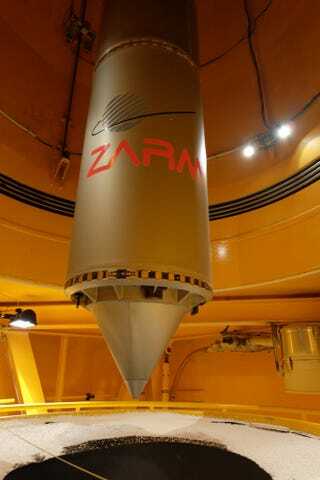 The researchers put their experiment in a drop tower at the Center of Applied Space Technology and Microgravity (ZARM) in Germany. It’s essentially a theme park ride, where a 4.4-foot pneumatic tube shoots a capsule 104 miles per hour to a height of nearly 400 feet (120 meters). The tube then falls for 9.3 seconds. Inside the tube is a battery, lamps, cameras, controllers, and a photoelectrochemical half-cell – basically, a light- and electricity- powered system that can pull protons from water and add electrons to create hydrogen atoms. Hydrogen could serve as an important fuel for future spaceflight missions. But creating usable hydrogen fuel in microgravity isn’t easy. Without gravity, there’s almost no buoyancy, so the hydrogen bubbles that form in the water create a froth that stays put and stops atoms and ions from moving. The researchers constructed microscopic tower structures in the cell which helped guide and release the bubbles, according to the new paper in Nature Communications. Brinkert stressed that they cannot harvest the oxygen from this system yet. They only generated hydrogen molecules. “It was amazing that they could create the hydrogen from water,” Thorben Könemann, the drop tower operator at ZARM, told Gizmodo. He said that this is one of a host of combustion, fluid physics, and fundamental physics experiments performed at the tower. While it would be super useful to be able to harvest hydrogen from liquid water during a deep-space mission, there’s still an issue of where the water is coming from. But we’ve written before that water is one of the main resources that space-mining companies hope to harvest from asteroids. This was just a first attempt at harvesting hydrogen from water, said Brinkert. The paper notes that the International Space Station already has a system that splits carbon dioxide into carbon and oxygen. But they write that they’re the first to directly split hydrogen from water in microgravity conditions.